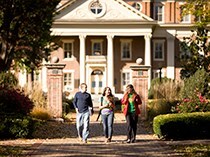 Roanoke's Orientation program seeks to assist you in your transition to Roanoke College. Whether you are a traditional first-year student, transfer student, or commuter student, orientation is designed to give you the resources you need to match the challenge of the transition with the support needed to be a successful member of the Roanoke community of learning. Acclimating to college life does not happen quickly and we acknowledge this by providing an orientation program that spans from your admissions process through the end of your first year. Fall Start, first Year, freshmen are expected to attend Spring Into Maroon "S.I.M." in June and a four-day orientation program starting with Opening Day in August. *NEW* a 5th SIM option has been added! If traveling in the middle of the week is convenient, consider registering and attending our Wednesday SIM date, June 26. Each year Roanoke College builds a house with Habitat for Humanity for a family in need in the Roanoke Valley. 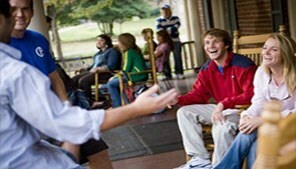 During orientation, the incoming students get to participate in building the "R-House." Students receive hands on experience, anything from raising the walls to hammering down the roof sheathing. Join your fellow accepted students and get to know one another before this upcoming fall, at the Roanoke College 2022 Facebook group, or #maroons2022 on Twitter and Instagram. It's a great opportunity to talk about college and ask questions concerning your upcoming year while getting acquainted with your new class mates.